Disclaimer: I am not an expert forager, so please do not take my word for it. Always do your research and be 100% sure you have properly identified a plant before consuming wild edibles. There are many poisonous plants and plant parts to be aware of, so never be nonchalant about what you pick and put in your mouth. As Spring arrived this year, our forest floor came alive with a new and mysterious plant. I don’t know if they’ve been here before in lesser numbers and I just never noticed them or what, but you certainly can’t miss the carpet of green foliage that covers our creek banks right now. They’re EVERYWHERE! But what in the world are they?? They aren’t a flower, or a fern, or a mushroom, or a tree… I had no idea how to even go about looking up what they’re called. I noticed that the plants didn’t all have the same number of leaves. Some had six, some had seven or eight. Some were solid green, and some were splotched. For weeks I’ve been dying to know what they are, and yesterday through another online search I finally identified them. That was cool to know. I’d never in my life heard of Mayapples. Are they good for anything? Are they edible, or medicinal? After doing a little more digging, I learned that Mayapples ARE edible! At least, they produce a fruit that’s edible. The leaves and stems are poisonous, so definitely don’t eat those. With this revelation, I took another trip into the woods to examine the plants a little closer. I gasped with excitement when I discovered that some of the plants already have flower buds forming. This little beauty ought to ripen into a lovely yellow fruit around June-ish, I believe. The trick will be getting to it before the forest critters do. Green, unripe Mayapples are mildly poisonous, so you must wait until they’re fully ripe to pick them. As the fruit ripens, the umbrella shaped leaf dies away, leaving only a stem and a dangling fruit. I read that it can be hard to find them because by then the other plants have grown up around them, hiding the fruit from plain view. 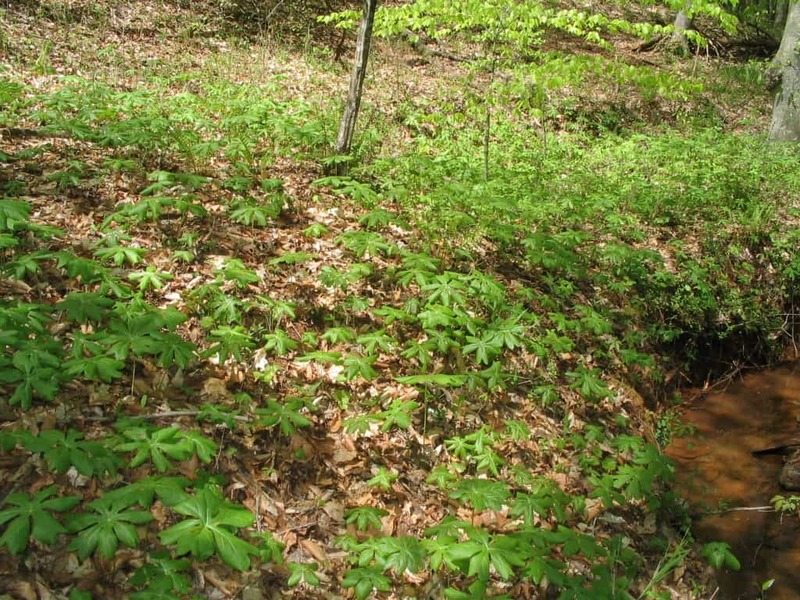 The forest will smell like lemons when it’s full of ready-to-pick Mayapples. Some suggest that it’s easiest to just follow your nose to find them. I’m thinking I might cover a few with a wire cage before they go into hiding, so that I might just beat the squirrels to at least one or two fruits. This guy only has one leaf and no flower. So, it’s the two-leafed plants I’ll be keeping a close eye on. I’ll try to remember to post updated photos as the fruits ripen. It’ll be so fun if I can get my hands on a few ripe Mayapples. 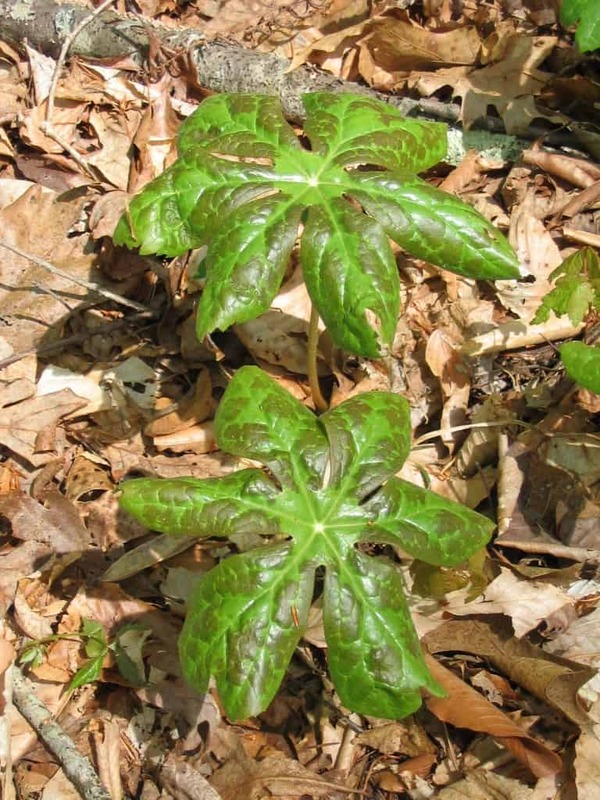 Eat The Weeds has a great article on Mayapples, with more information and precautions. 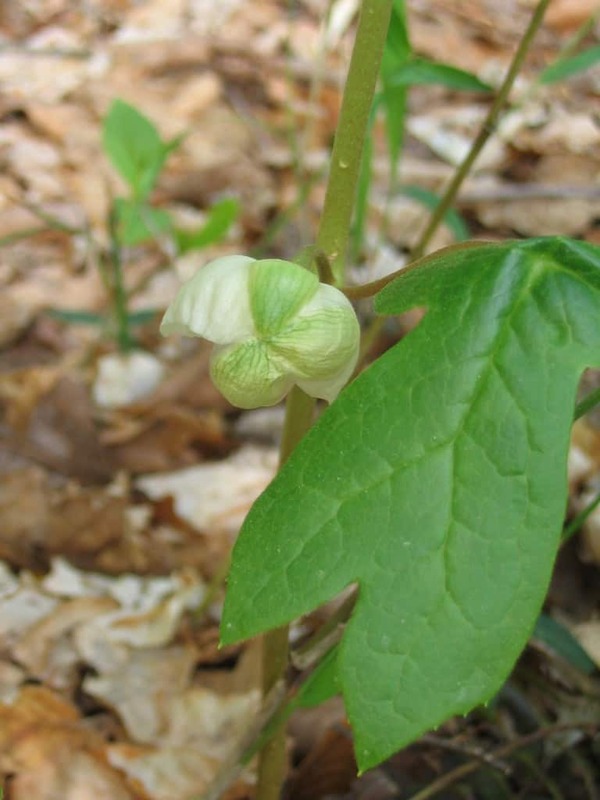 July 13th, 2014: I took a walk into the woods this morning, to check on the progress of the Mayapple fruits. They’re still green and hard, not even close to being ready to harvest. I’ll keep checking back with the hopes of collecting at least one ripe fruit to sample. Do you have Mayapples growing nearby? Have you had a chance to taste them? We had mayapples in Northeast Missouri where I grew up. 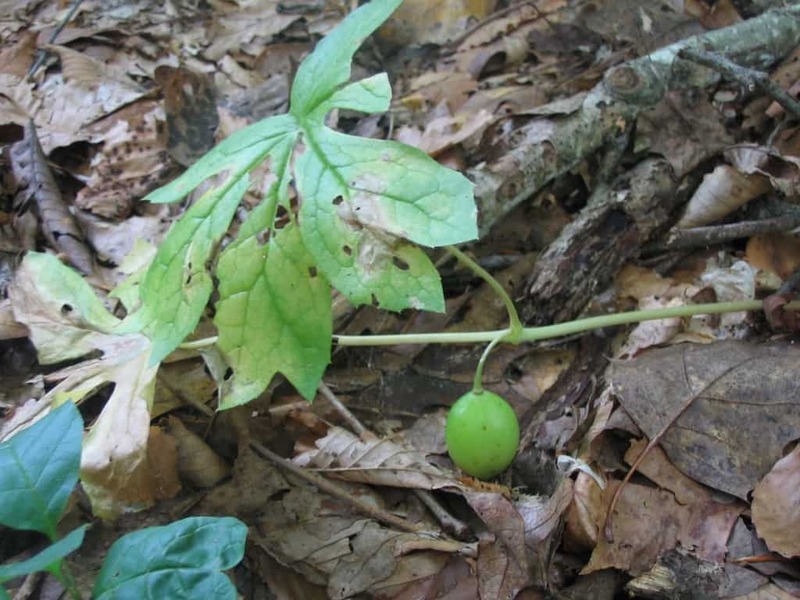 The ripe mayapple has a custard like taste. 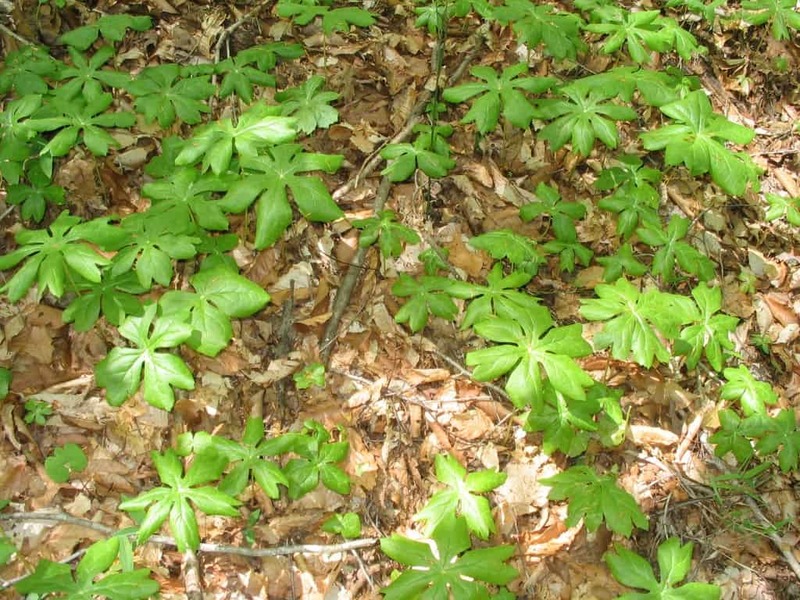 The plants with two leaves are the mature ones, they take a year or two before a mayapple will fruit. I’d be interested in knowing whether you ever got to taste the Mayapple. 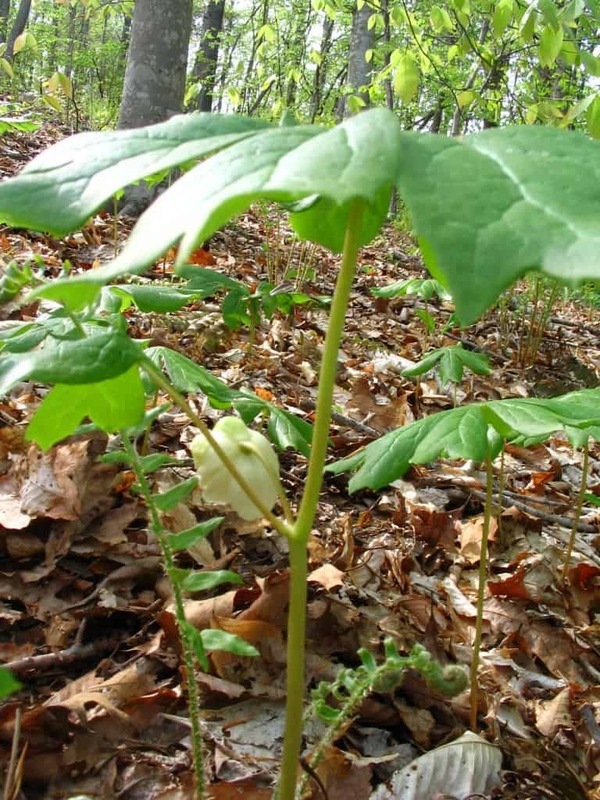 I’m very experienced with the Mayapple plant, having watched it grow since I was a child. 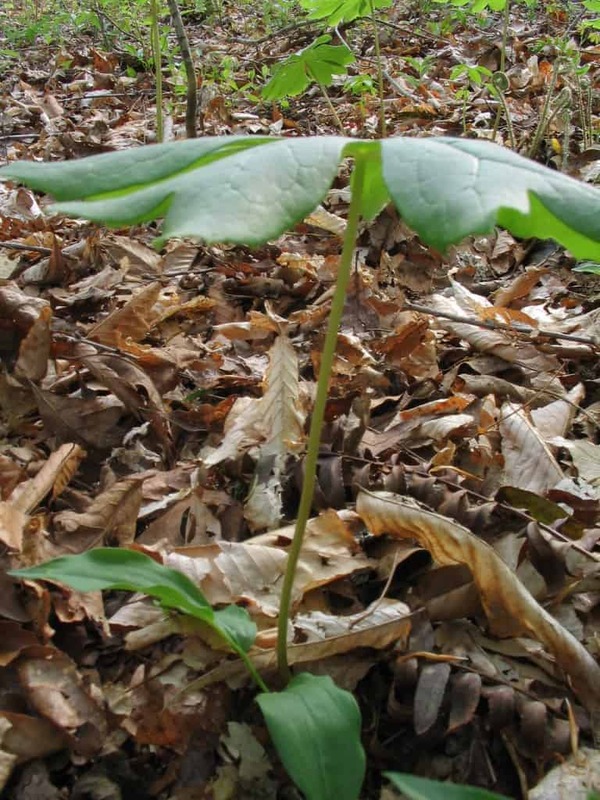 We have them by the thousands in the Mid-Western U.S. (Illinois and Missouri) and we use the growth of the Mayapple in determining the proper time to hunt morel mushrooms. The fruits are easy to spot early in their life-cycle, but by the time they are ripe, they are mostly foraged by wood critters. My wife and I picked several yesterday – mostly unripe – and are going to attempt seeing whether they will ripen on the counter before rotting. And then we are going to eat them. Hopefully. Just be careful with those unripe Mayapples. And don’t eat the seeds. I never did get my hands on a ripe one. I’m hoping to try again this year. Hello…one more quick bit of info…I have always found luck hunting morel mmushrooms along and under Mayapples! Here in Va…morels usually start to pop up about the time Mayapples open up like an umbrella….between late April and early may! 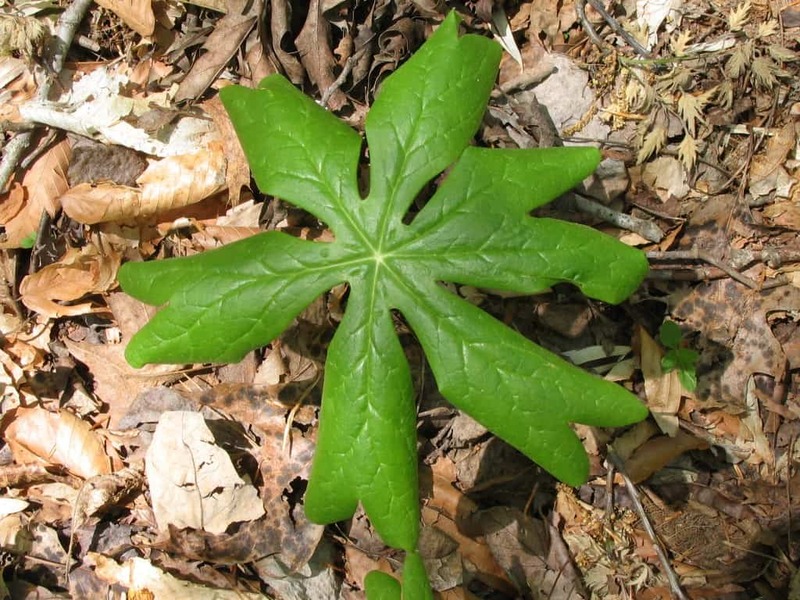 I’ve never tried the mayapple before…I know its not poisonous..just figured it wasn’t too appetising. Its about time to ginseng hunt here now..bestof luck to all the wild pickers!! That’s GREAT to know, Rockbridge. Thank you for the tips on morels and ginseng. I never know when the right time to look for them is. 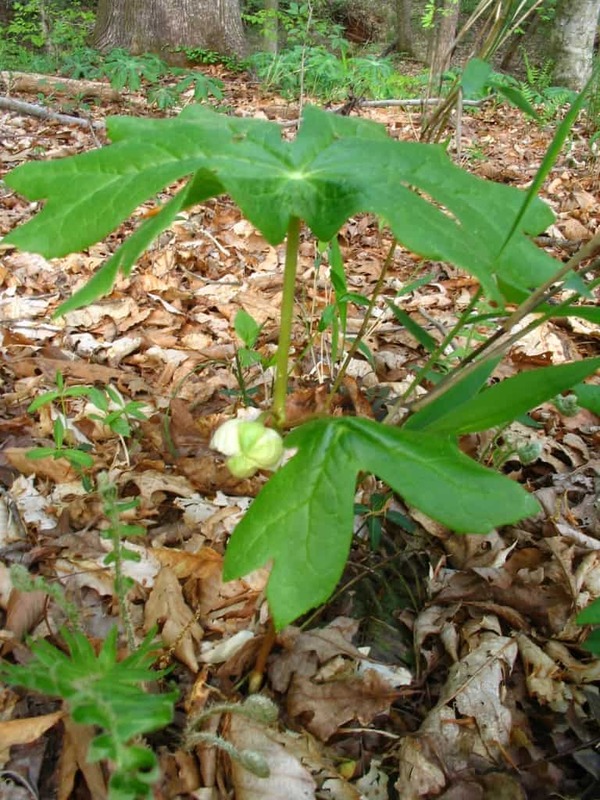 While the fruit of the Mayapple is said to be edible persons should use caution with the plant. The leaves, stems and roots are poisonous. Just touching the leaves and stems can cause a serious reaction for many folks. It would probably be a good idea to wear some kind of hand protection and long sleeves when attempting to pick the fruit. For many of you younger folks persons from the “hippie culture” in the 1960s and ’70s poisoned themselves by eating “poke salad” as a fresh plant without properly parboiling and cooking it. We have them in our yard as well and up the street and on many of the hiking trails around us. I knew they produced a fruit, but have never tasted them, so would be curious as to what your thoughts are when you try them. I found a Mayapple plant at a garden center about 15 years ago, and was delighted to get it to plant in my Georgia yard. It reminded me of the Mayapples I used to find in the Virginia woods. As of this year, they’ve spread nicely, and look really cool in the island in my front yard. I’ve yet to get a fruit from one of them, but I like your idea of a metal cage to keep the critters from getting all the fruit first. Very interesting article. Too bad they dont grow in South Florida. I also read that it is also a medicinal plant. I watched Ruth Goodman pick mayapples on one of the historic farm series she did on BBC 2, but I just assumed they were a British plant. Now that you’ve shared, I believe I have them in the woods surrounding our property. Thanks for sharing! That would be awesome if you can find them also, Kate! Love this info. The children and I will check them out. We love learning about wild foraging. I hope you get to taste some, Hope! That’s what those are? So cool 🙂 When I was little my Grandma had a ton of these in her back yard, and either I was little enough or they were big enough I could hide under them. There are less now ’cause the black raspberries have choked out some of them and also the English Ivy. It’s tempting to see if any of them have berries. I hope you can find some, Kassandra!! My husband told me that his grandpa used to have them growing all over his forest floor, but he always said that they were poisonous. I don’t think he knew they have an edible fruit. You know, I believe we have those as well behind our house on the hill going down to creek. Thanks for the information. I just might check them out. 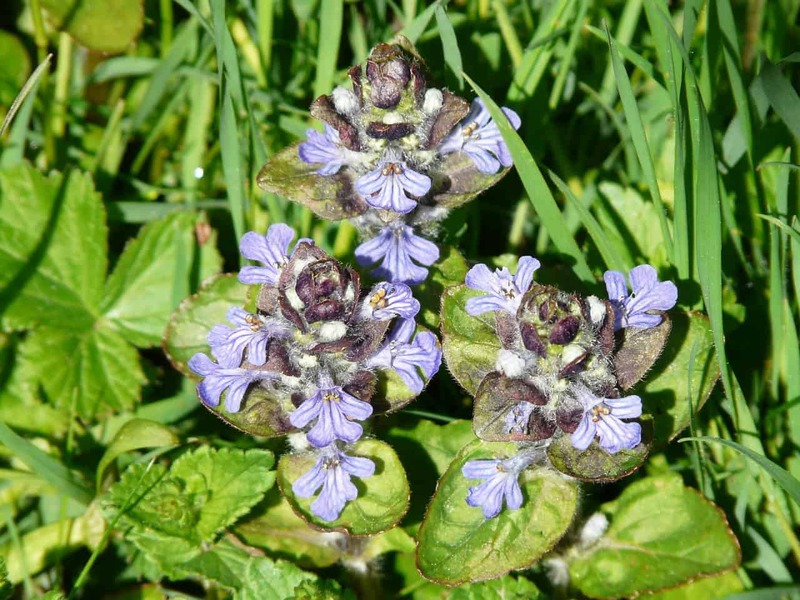 I looked them up in my Edible wild plants book and they are also in the Medicinal Wild Plants book as well. Seems the roots are excellent in the treatment of warts, venereal disease, and cancers. The Cherokee Indians use to make a tea each season and drink small amounts as a purgative and emetic. Also to kill and expel worms from their digestive tract. They made a tea from the roots and gave in minute doses to the children as a spring tonic. Lastly, the root tea was credited as an antidote for poisons and snakebites. Amazing, drink a poison tea to kill a poison. Amazing discovery you came upon. 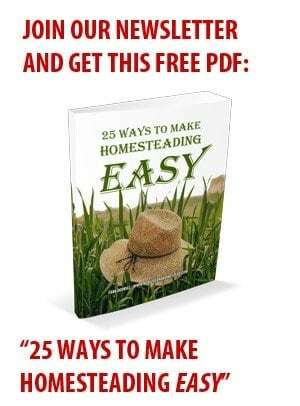 Great information. Thanks a bunch.